Before talking about any potential workaround or solution it is important to understand what is the cause for this delay in terminology editing in Studio and MultiTerm 2014. With Studio and MultiTerm 2014 SDL has adopted and adapted to Oracle’s (the company developing Java, which is the software platform that MultiTerm uses) security concept. Under the requirements of this security concept the components need to be digitally signed so that their validity could be verified. This is a basic and common security concept in the computer security world, used to minimize security risks and mitigate vulnerabilities by preventing malicious developers from posing as trusted entities in an attempt to execute their malicious code in the systems of unsuspecting users. In other words, the validity of a software component must be verified before it is allowed to run, and this verification process is the cause for the terminology editing delay in Studio and MultiTerm 2014. Although this delay should be most noticeable on the first editing attempt in a session and much shorter afterwards, some users (me included) report a noticeable-enough delay also in the subsequent editing attempts. It should be pointed out that this security check is not just a random, arbitrary step that slows everything down for no reason. The benefit of adhering to the requirements of Oracle’s security concept is a more robust Java integration that should reduce the amount of security prompts that a user experiences and the required number of workarounds to be applied that for some users have historically been a serious security and/or productivity problem – and just as much of a nuisance as this delay – and overall improve the stability and reliability of Java operations within Studio. Personally I think that conforming to Oracle’s security concept is a good thing as long as Java is used. This relatively short delay in terminology editing is generally an acceptable price to pay in the interim for achieving a more stable terminology working environment, but when doing a lot of terminology editing work these little delays do add up and there is no denying that they impede productivity. I knew that the security check is most likely the cause of this delay, and because I do not know a whole lot about Java I set to investigate this subject a little further in an attempt to learn how they work. Although I have learned quite a lot in the process I do not pretend to be an expert on Java, so the following explanation is just a quick and superficial overview of this quite broad subject. As mentioned above, to improve security and stability the Java components that Studio uses are now digitally signed. This signature is called a certificate (think of it as an Identity Card) that can be set to expire after a certain amount of time, or on-demand. Before any Java component is allowed to run in the system, the validity status (called revocation status) of its certificate is verified to make sure that it is what it claims it is, and that its certificate is still valid and has not been revoked for any number of reasons. 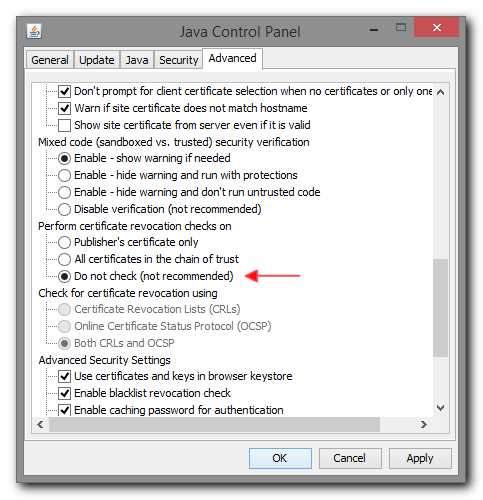 If the component passes this verification process it is allowed to run; if it fails, a security prompt is displayed to the user and/or the component is allowed/disallowed to run, all depending on the system Java security settings. Certificate Revocation List (CRL): a Certificate Revocation List, or CRL for short, is a list of certificates that were issued by an issuer and since have been revoked (i.e. expired). This is basically just a simple file that is downloaded and cached in the local system. Online Certificate Status Protocol (OCSP): An internet protocol, and an alternative to the CRL method, used for obtaining the revocation status of a certificate by sending a request to an OCSP server that returns the revocation status of the certificate. This mechanism is generally considered preferable over the CRL method because it always has the most up-to-date information, its more resource efficient, and generally considered more secure. 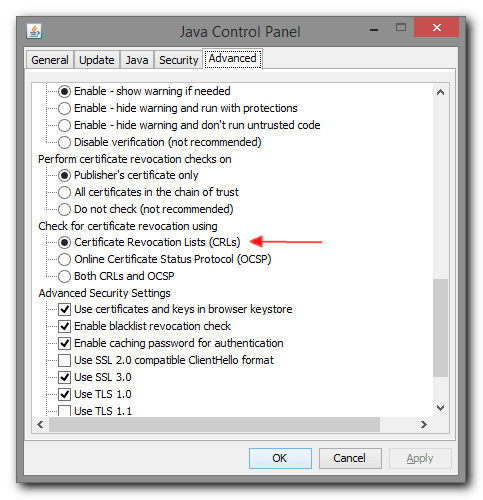 Recent Java versions have both these methods enabled by default, and from my investigation and little experiment on my system, the OCSP method seems to be the culprit causing the delay. However, I’m not sure exactly why or where things could possibly be optimized. In this article I’m suggesting two workarounds for disabling the OCSP security check, and in more extreme cases (that should be rare), both security checks; thus considerably shortening the delay. However, it is very important to note that the resulting performance gain is achieved by sacrificing some security, although. That said, for the average Studio and MultiTerm 2014 user in a Small or Home Office environment, where Studio and MultiTerm are the only (or at least the major) Java-dependent software being used, and one that follows a common sense and some basic computer security best practices (such as keeping the Operating System and program up-to-date, not installing or opening files from unknown sources, avoiding questionable websites, etc. ), the security compromise involved with this workaround is quite acceptable and well within tolerable margins, and for many users the performance gain probably outweighs this risk. Disclaimer: Please note that this workaround is intended for users maintaining their own system and/or local IT infrastructure. It is NOT intended for users in an organization or other work environment in which their system and IT infrastructure are managed by a dedicated IT team. In such case please contact the person responsible for maintaining your system. It should also be noted that I don’t take any responsibility for any issue that may arise from applying this workaround. Therefore, proceed at your own risk and understand that while I did successfully test this workaround on my system, there are far too many system-specific variables to account for, so your mileage may vary. This is the preferred workaround because for most average users the resulted security compromise is almost negligible. Restart Studio and/or MultiTerm 2014, as appropriate. If the preferable workaround described above did not work as expected, it is possible to disable both revocation checks altogether. Note that this workaround results in a bigger security compromise, but for the average user it is still considered minimal and acceptable. SDL Trados and Studio have a long history of Java-related issues. Even thought they usually stem from the Java side of the equation – which is not under SDL’s direct control – SDL responsibility lies with their decision to use Java. This last terminology delay issue serves as an excellent example for why I [since long] think Studio should get away from Java; while this issue is not a problem from a technical standpoint (because there is nothing to fix really, this is just how the security mechanism works) it is very much so from a User Experience perspective and SDL will do right by addressing it from that angle instead of the more traditional and obvious technical one. While most of the time these Java issues are eventually resolved by a patch or workaround, it is almost always a little too late as far as many users are concerned. I strongly urge SDL to drop Java altogether, which I think will enhance the User Experince, and potentially also the Secutiry and Stability in the process. Hi Shai – thanks for the great blog article – we’ve done more research in the meantime and it seems that you can keep the revocation check active and choose “Certification Revocation Lists” (CRLs). What slows the applet down is the online check. This will increase security significantly. We will document this in our KB also. Considering the plea 🙂 – we hear it, things won’t change overnight but getting away from Java on the client side is a key requirement for us. Thanks, Daniel (product management at SDL). I was investigating a little more into this subject earlier today, and with a little trial and error and a bit of network analysis experiment also came to identify the OCSP as the likely culprit here. Thank you very much for confirming this because I could have only tested it locally on my system. I don’t think that anyone expects for things to change overnight (I know I don’t), it is just that many users couldn’t care less about the technical reasons and explanations, they just want and expect the software to work reliably. It’s good to know that getting away from Java is a priority. The first workaround did the trick for me! Thanks a lot for sharing! Thank you for your tips. They were really useful and, after following, now Multiterm works as it should have done when released. I don’t know why Trados, after so many years and the cost of their products, still continues to have problems with Java. In his comment above Daniel, of SDL, confirmed that they are planning to get away from Java. This is a little reassuring, and I just hope that they will follow-up and see it to completion. Thank you for taking the time to comment, Mel. I appreciate it.